Safety and welfare should be paramount considerations when planning and delivering services in the following industries such as the hospitality industry, the health sector and the prison sector. If you have a duty of care, then you must abide by health and safety rules. When it comes to fire prevention, this means ensuring that any bedding items you use such as duvets, linen and mattresses adhere to British Safety standards BS7175. What is fire prevention fabric? Fire prevention fabric comes in two types: Flame resistant and flame retardant. Fabric which is flame resistant is made from fibres which have flame resistance built into its chemical structure. Flame resistant material is designed to stop a fire from spreading. It may burn, but it will do so extremely slowly and very often is self extinguishing. Flame retardant fabrics have been chemically treated, usually with bromine to be self extinguishing or extremely slow burning when exposed to an open flame. All products and equipment that meet British Safety standards will be clearly labelled and so give you piece of mind. BS7175 marked products, for example, have usually been tested under a range of situations that commonly cause fire. A common cause of a fire starting from a bed is from a smouldering match or still lit cigarette. 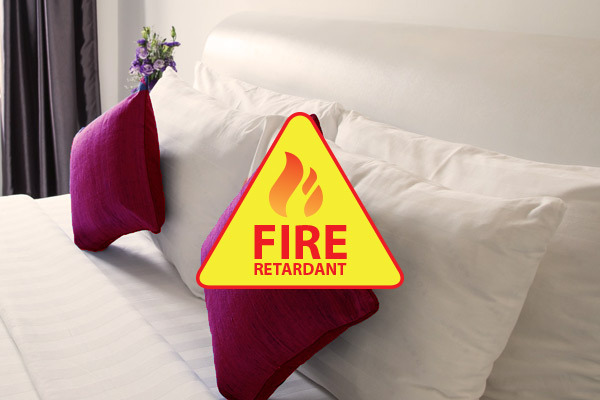 Fire retardant bedding ensures that it does not catch fire and the fire does not spread. The chemically treated bedding will not catch alight and will usually put itself out if left unattended. This is very useful if beds and bedding are used by vulnerable clients. For example, a high tension environment may see beds and bedding set alight deliberately; fire retardant bedding can prevent a grave situation from getting worse. Fire retardant bedding is also usually machine washable, able to be thoroughly cleaned and reused yet still remain flame retardant. And because fire retardant bedding is not significantly more expensive than regular bedding, you are buying bedding not only at comparable cost but with additional functionality that does not diminish over time. Another benefit of fire retardant bedding is that as well as being functional and safe, you needn’t compromise on aesthetics either. Fire retardant bedding is of course, useful and functional, but depending on the sector you work in and the demands of your customers, fire retardant bedding can also be beautiful. You needn’t plump for stiff, white bedding if you don’t want to. Nowadays, fire retardant bedding is available in a range of colours and sizes. Often it is made from polyester, but this helps further prevent the risk of a fire starting and spreading. So you’ll be able to individually, bulk buy or custom purchase fire retardant bedding that not only meets but exceeds the demands and requirements of your clients and customers whether you work in a hostel or hospital.